Titanic, the Musical | Heather R. Chambers, CPA, Inc.
Heather, Melody, and Tracy will be performing in FCCLB’s production of the Tony Award winning musical Titanic in November. This epic production in the historic sanctuary of First Congregational Church in downtown Long Beach features a talented cast of forty accompanied by a live orchestra and supported by a full pit chorus. 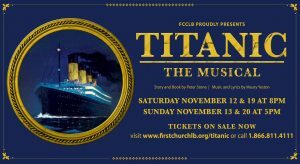 For more information and a link to buy reserved seats visit www.firstchurchlb.org/titanic. Previous PostCorporation & LLC ChecklistsNext PostGetting ready for tax season!